Get ready. The head of Volkswagen Group design has confirmed to TopGear.com that work on the next Bugatti model is well underway, with an expected launch in early 2016. 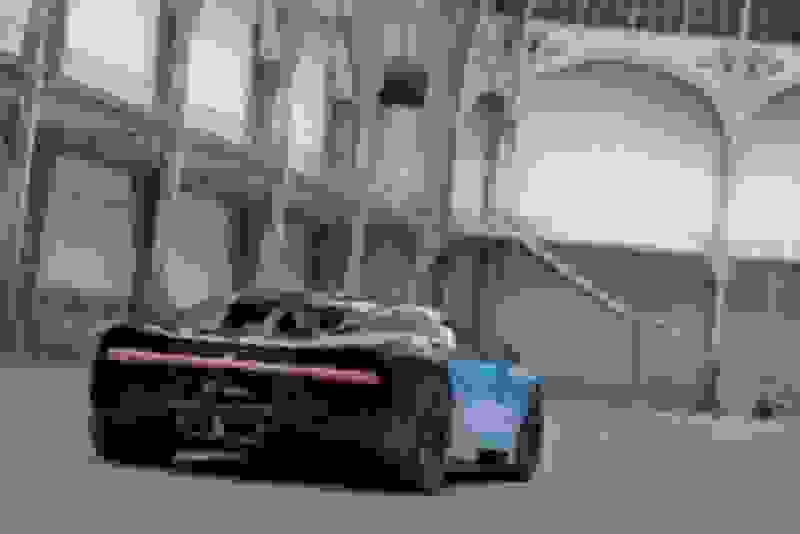 De Silva wouldn’t confirm exactly what form this new car would take, but did concede that it “won’t be a Veyron replacement, it’ll be more than that. We’re investigating all avenues at the moment”. Tech-wise, again, de Silva remained tight-lipped, but did say how the company is putting “a lot of attention in the technology for the new Bugatti. We’re developing a few different concepts at the moment, working together with the engineers and designers at the same time. “Bugatti is something that in the end is a car, OK, but it’s a car that is a lifestyle. Bugatti is a part of your sensitivity, of your feeling,” de Silva added. So what do we know, then? Earlier this year, Bugatti boss Dr Wolfgang Schreiber told Top Gear that the company would not build a ‘SuperVeyron’ or indeed a production version of the 2009 Galibier concept (pictured above). 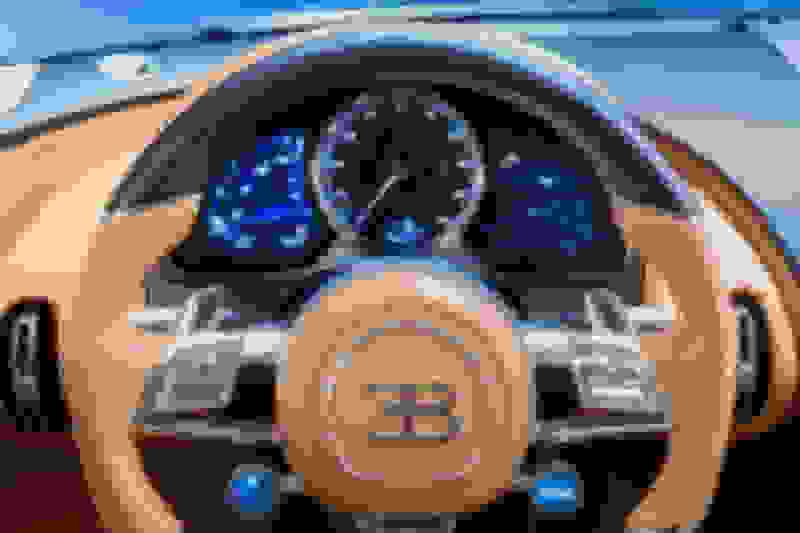 Development of a successor for the Bugatti Veyron is well underway, but apart from the vehicle being fitted with hybrid technology not much is really known about the new model. There are plenty of rumors, however. The name of the new car is rumored to be Chiron, which is the name of a centaur in Greek mythology but also that of Bugatti racing driver Louis Chiron, who was influential in building the brand’s legend in the early parts of the last century. 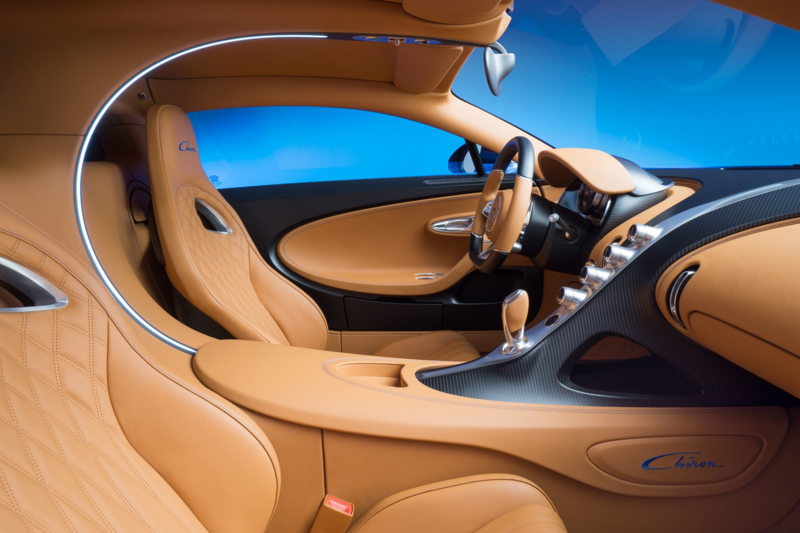 A lighter and more rigid version of the carbon fiber monocoque chassis (with aluminum subframes) of the Veyron will likely be employed, along with the Veyron’s existing quad-turbocharged 8.0-liter W-16 engine. And we should see a version of the Veyron’s seven-speed dual-clutch carried over, albeit with an integrated electric motor to form the aforementioned hybrid component. 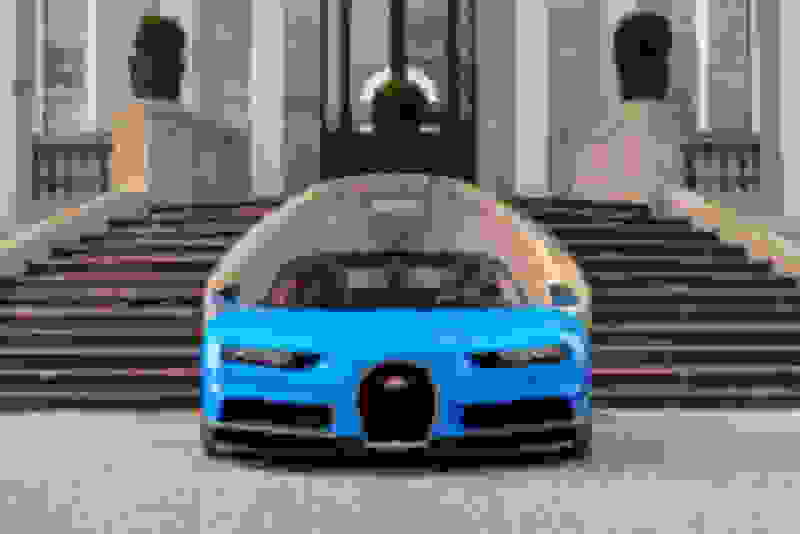 While the electric motor will add some additional horsepower to the car’s output, to reach the expected 1,500-hp target, up from the Veyron Super Sport’s 1,184 hp, Automobile magazine is reporting that the 8.0-liter W-16 will receive direct fuel injection and increased boost pressure from its four turbos. Two of the turbos are also expected to be electrically driven at lower rpms, to help eliminate turbo lag and ensure the car’s engine is always on the boil. Performance estimates include a 0-60 mph time of less than 2.5 seconds and a top speed of 288 mph, or about 20 mph faster than the Veyron Super Sport. To achieve these figures, complex aero systems with active elements will likely be employed. 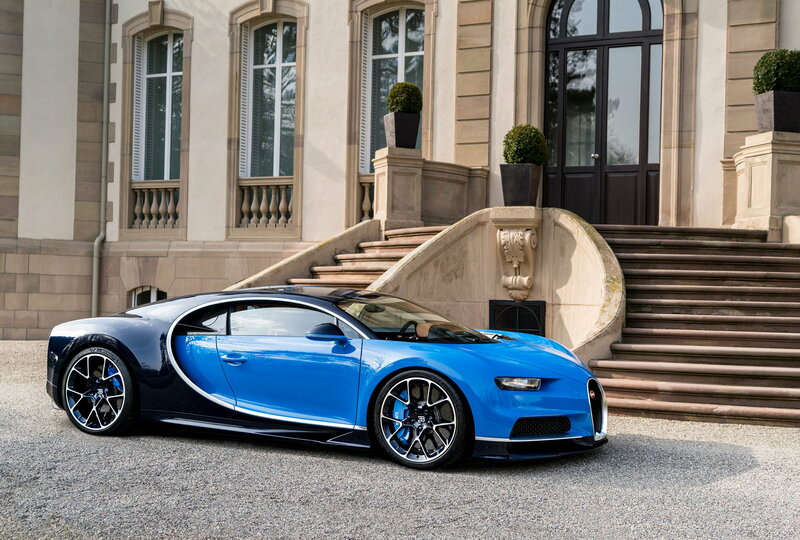 Unfortunately, the launch of the new Bugatti won’t take place until 2016. 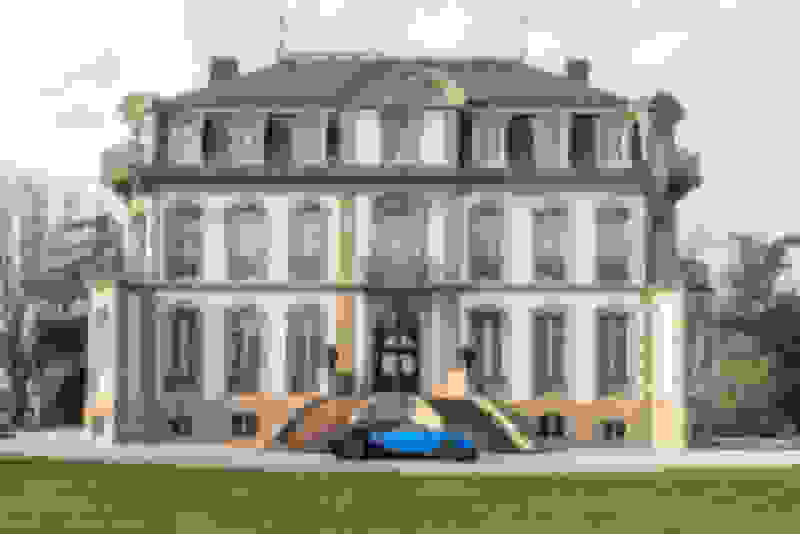 But with production of the Veyron due to end sometime in 2015, there are new rumors the French marque may introduce a unique Veyron-based speedster to fill any gap. 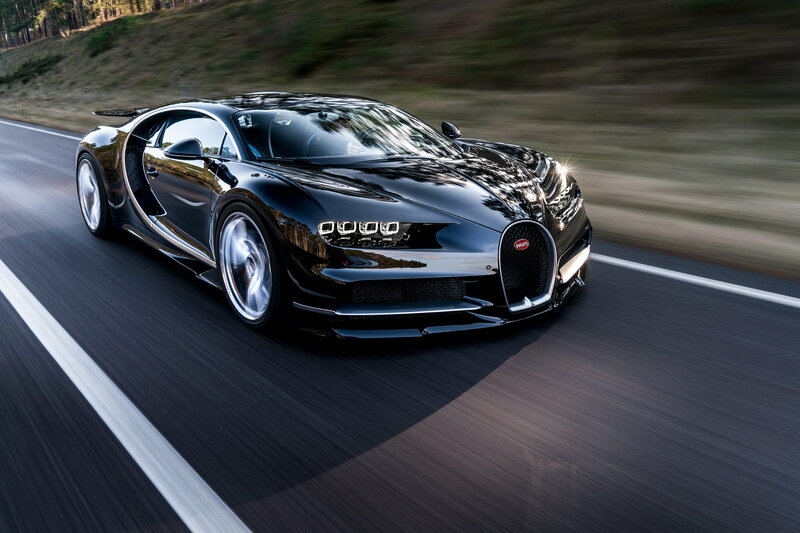 It’s well known Bugatti is working on a successor to its Veyron. 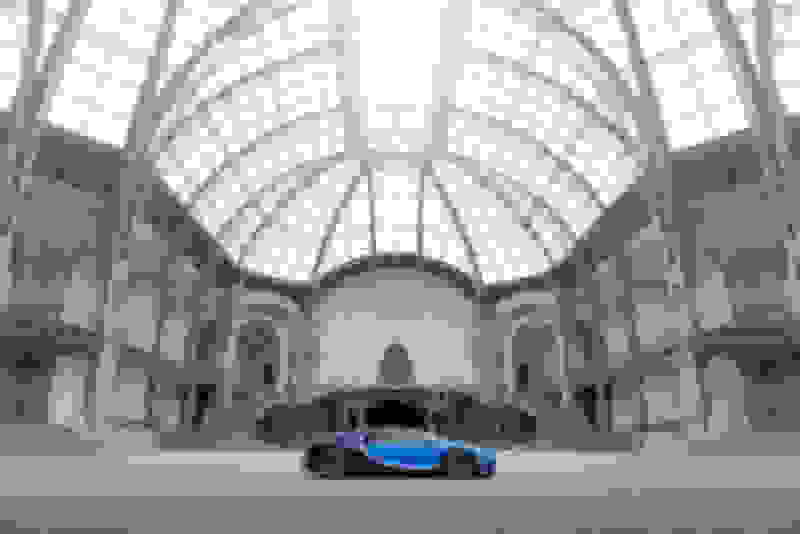 Test mules have been running around secret locations for more than a year, one of the first prototypes was spotted in Germany back in May, and just last week Bugatti released an official teaser video. Now we have what may be our best look yet at the car, which is tipped to be called the Chiron and due to debut sometime next year. 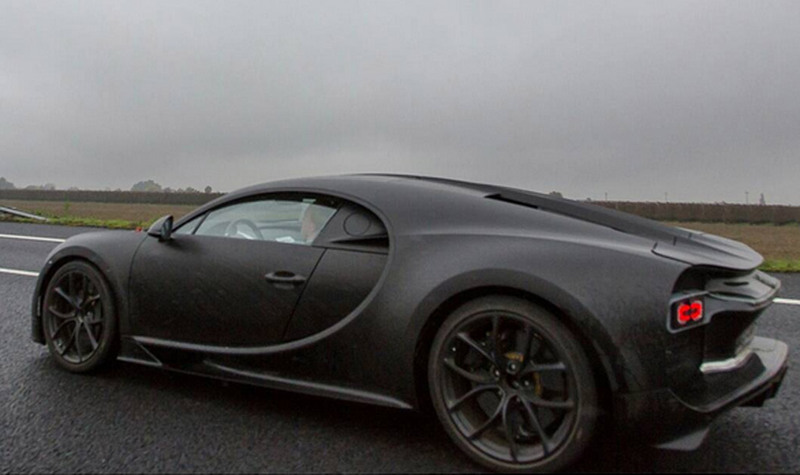 First, Dutch website Autoblog.nl posted a photo of a prototype for the Veyron successor. 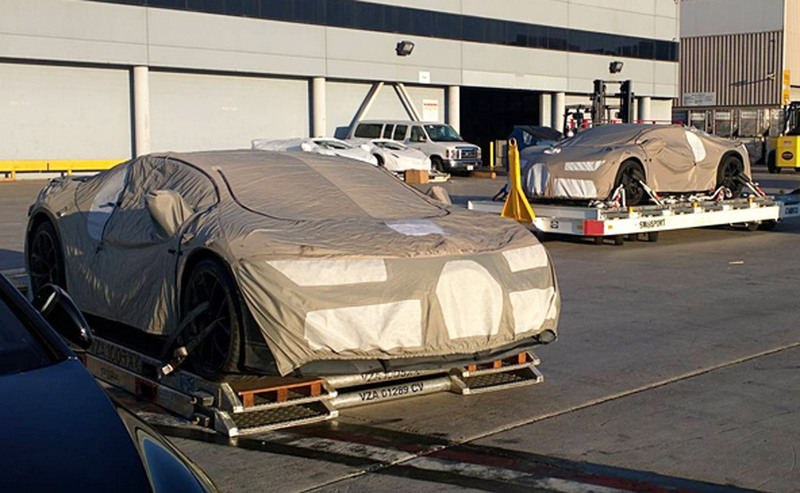 The car was snapped while being unloaded at Los Angeles International Airport prior to being transported to the recent Pebble Beach Concours d’Elegance for a private showing, the type where cell phones are collected before guests are allowed in. Now, two more photos have been posted online (see below), this time by Instagram user hungry_penguin (via duPont Registry). While the cars remain heavily camouflaged, plenty of details can be gathered. The styling is clearly evolutionary, but the lines are somewhat edgier and give the car a more modern feel. The lights are only temporary units but the outside edge appears to feature a sharp crease, which contrasts with the curved edge featured on the Veyron. It’s possible that the Veyron successor will offer two levels of performance (notice there are two prototypes, one with a massive wing extended). Volkswagen Group CEO Martin Winterkorn recently hinted that the expected hybrid system on the Veyron successor will be reserved for a high-performance variant, with the standard model to be powered exclusively by an internal combustion engine. That engine will be common to both models, though. 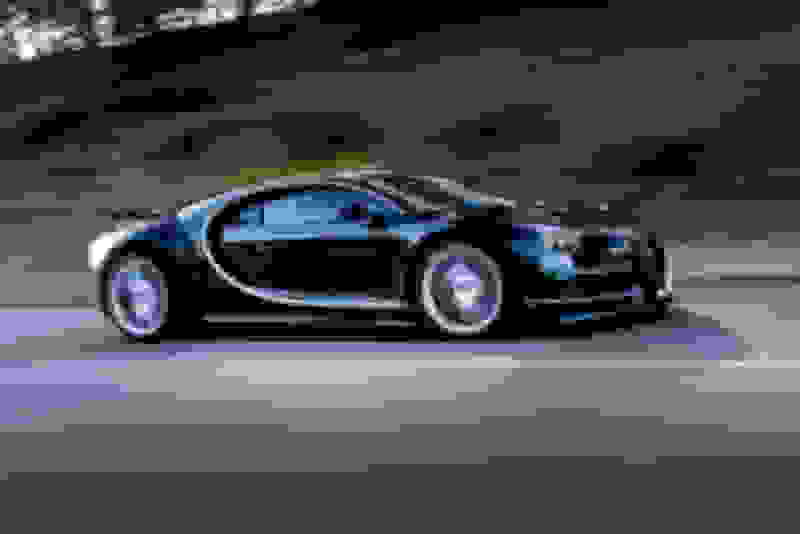 It will be an uprated version of the Veyron’s quad-turbocharged 8.0-liter W-16. Peak output of the hybrid variant is expected to top 1,500 horsepower, which will allow the Veyron successor to accelerate from 0-60 mph in close to 2.0 seconds, down from 2.5 seconds in the 1,184-hp Veyron Super Sport. Top speed, meanwhile, is thought to be as high as 288 mph, or about 20 mph faster than the land speed record-holding Veyron Super Sport. Not bad. I never was a huge fan of the Veyron from an appearance POV. ^ Why would they drive those prototypes with these other cars? It's a given that people will take photos of these cars. How do you introduce a car like the Bugatti Chiron? This is the successor to the Veyron, the most epic exercise in over-engineering that the car world had known until today. 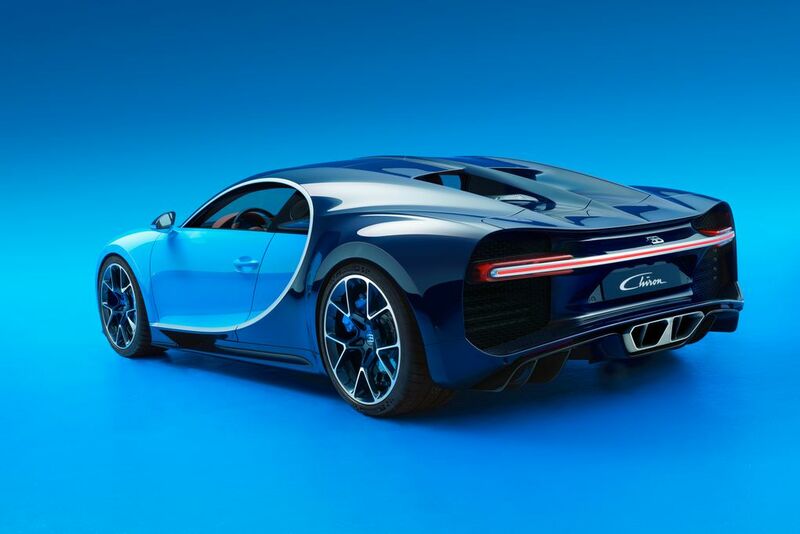 The new Chiron turns the Veyron's extreme specs up another notch: 0 to 100km/h in less than 2.5 seconds, four enlarged turbochargers, and a total power output of 1,500hp. 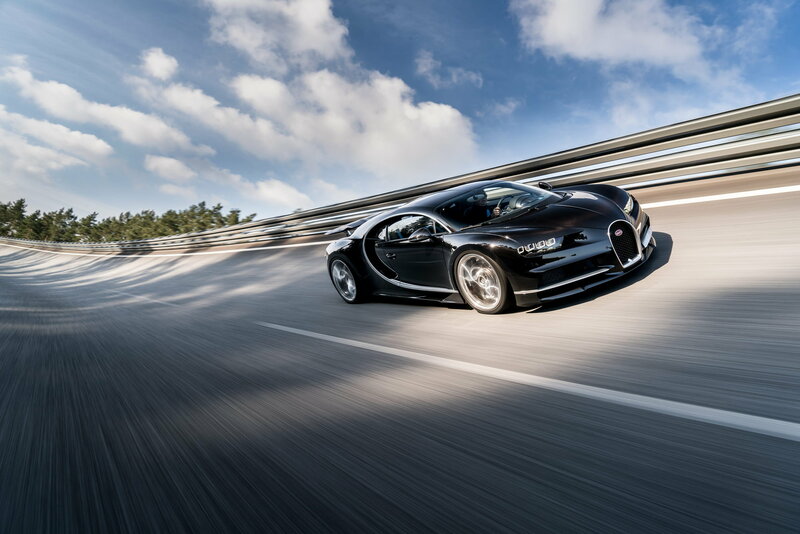 Maximum speed is limited to 420km/h for road use, the tires have been specially developed by a Bugatti-Michelin partnership, and the 8-liter W16 engine of the Veyron has been completely redesigned. Only 500 Chirons will be produced, and a third of them have already been sold for €2.4 million apiece. The Geneva Motor Show will play host to many debuts this week, but none will outdo the Bugatti Chiron's combination of performance, luxury, and exclusivity. 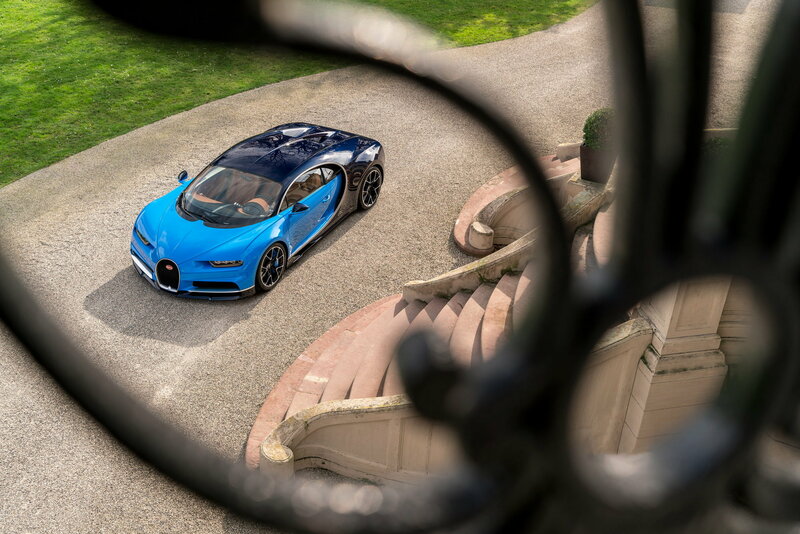 "Bugatti has tested the limits of physics," says company president Wolfgang Dürheimer. 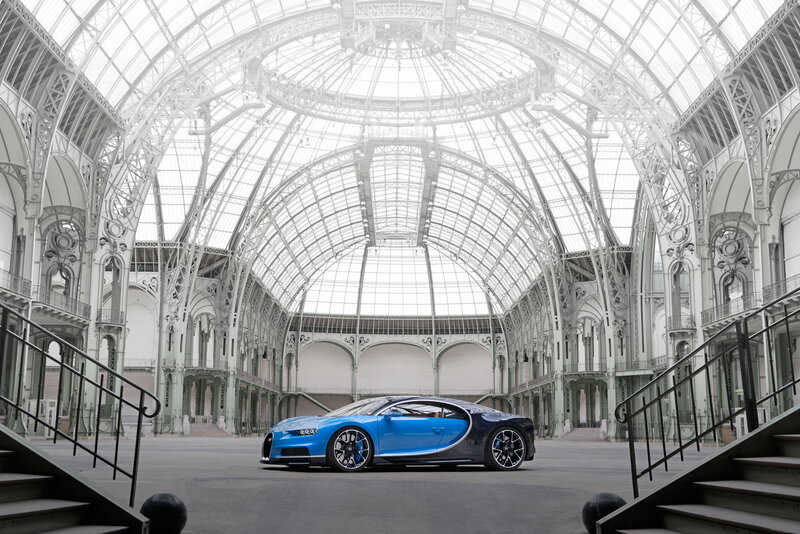 "The Chiron is the result of our efforts to make the best even better." 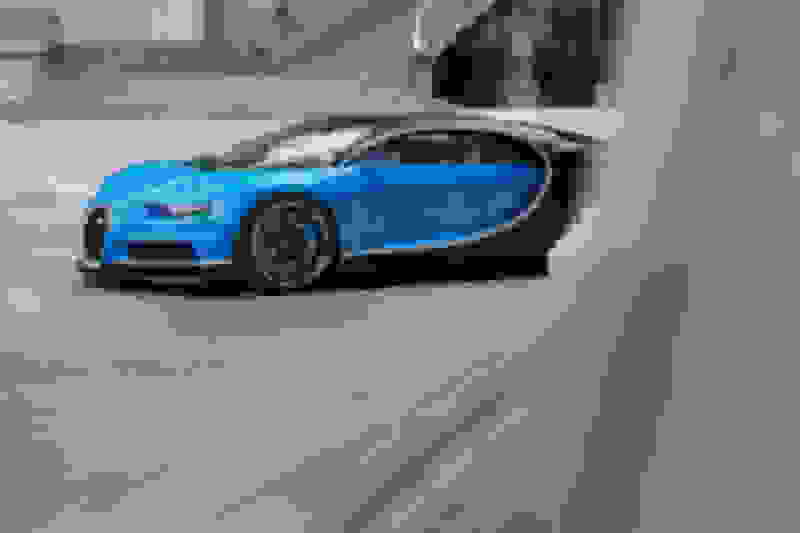 With that in mind, Bugatti has constructed a new carbon fiber monocoque, which serves a dual purpose: communicating Bugatti's new, more aggressive design language and also enabling the car's fierce performance numbers. The Chiron has a new titanium exhaust system and the first airbag to shoot through a carbon fiber housing. Its array of eight LED headlights is complemented by what will likely become the Chiron's visual signature: a single rear light spanning the car's width. 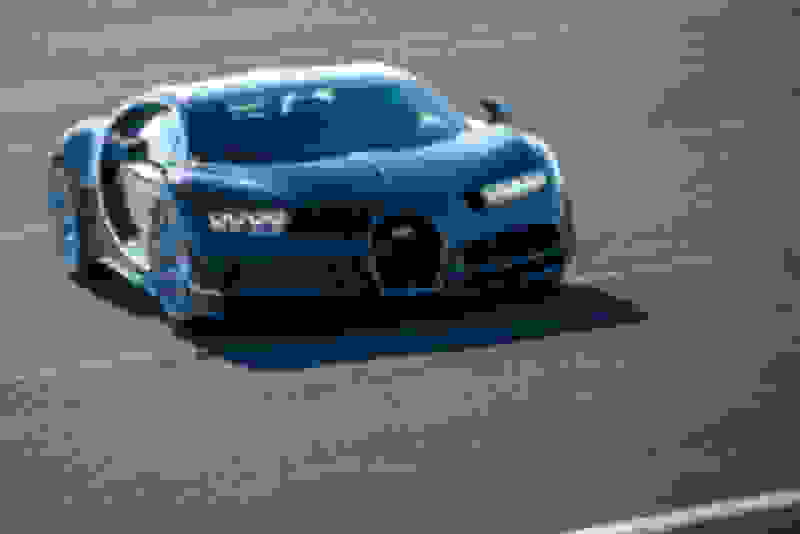 The one tantalizing omission from Bugatti's Chiron announcement is the car's absolute top speed — the company just says that the Chiron is ready to set a new record for production sports cars. "The world's fastest concert hall." 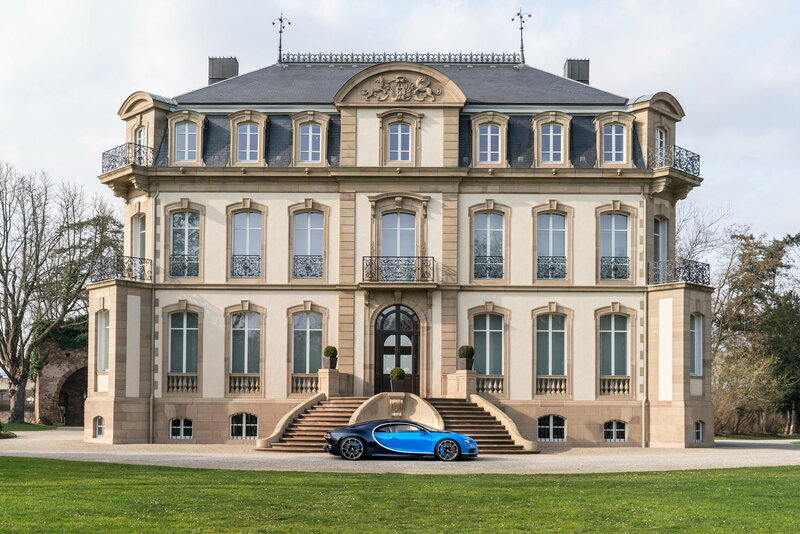 For all its beastly attributes, Bugatti wants the Chiron to be known as a luxurious beauty too. The interior is appointed in leather throughout and there's now a luggage space big enough to fit a reasonably sized suitcase (44 liters). Three high-resolution digital displays surround the analog speedometer in front of the driver, with the information on them adaptively changing in response to the car's speed. 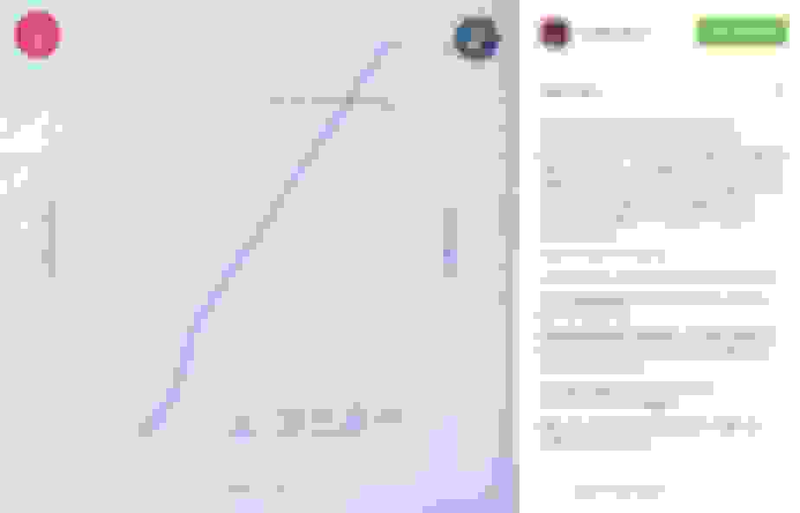 The faster you drive, the simpler the presentation becomes. The Chiron's audio system is so good, says Bugatti, that it can be considered "the world's fastest concert hall." This is where the company's penchant for excess truly manifests itself: there's a one-carat diamond membrane in each of the four tweeters inside the Chiron. 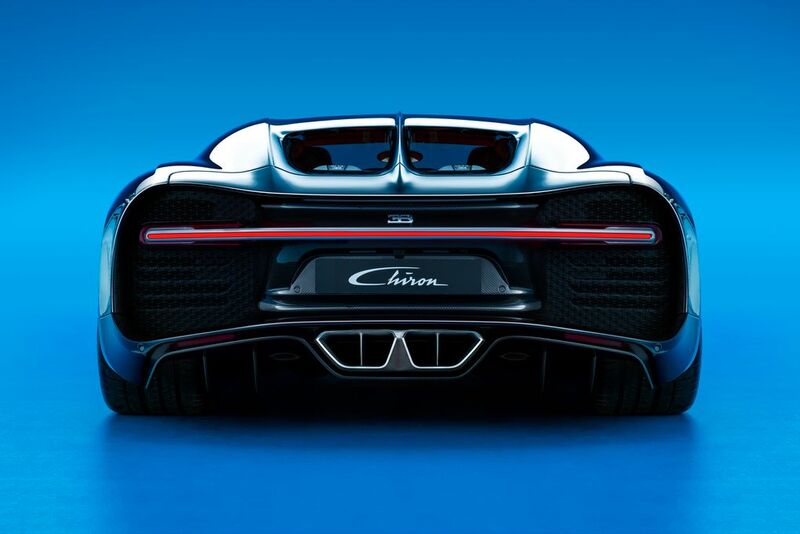 The Chiron's new adaptive chassis can be adjusted for different levels of ground clearance, and its underbody has grooves and active diffusers to guide air around the car. Most of the adaptive stuff is automated: the shock absorbers, chassis height, power steering, and the aerodynamic and brake control systems all adjust according to how you are driving. Bugatti's Chiron has five modes, with the basic Auto activating at 50km/h, followed by Autobahn mode at 180km/h and beyond. You can also switch it into handling mode, for when you want to race, or use the separate ignition switch for top speed, which gives access to that formidable 420km/h max speed. 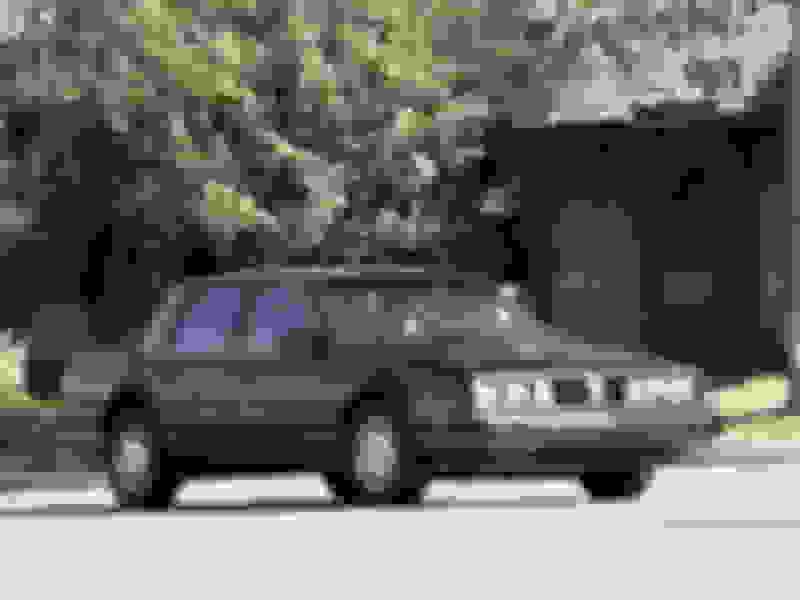 The car's spoiler is part of all this self-adjustment fun, with various levels of extension for top speed and Autohbahn / handling modes, as well as the ability to serve as an air brake or simply retract entirely. Finally, this car also has an "easy-to-drift" feature, because why wouldn't it? Having bid goodbye to the Veyron at last year's Geneva Motor Show, Bugatti has returned with a successor that faithfully carries on the proud heritage of performance fanaticism. 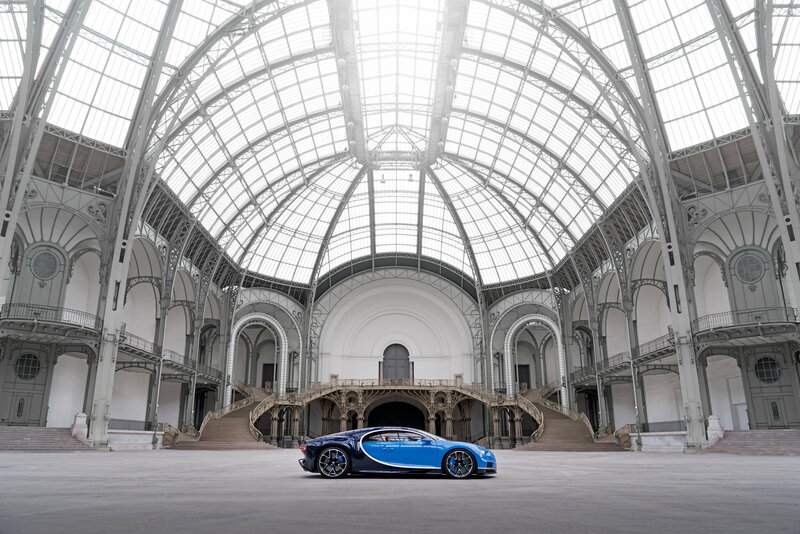 Espousing a design philosophy of "form follows performance," the new Chiron was built with speed and driving pleasure as its foremost considerations, though opulence isn't a very distant third on that list. This car's reason for existing is to allow its owners the peace of mind that they truly have the best production sports car anywhere. That's what the Veyron did for many. We'll see how the Chiron lives up to expectations once deliveries start in the autumn. Wow...what a huge improvement on the front design. Those headlights are so much more sinister than the last model. The specs are ludicrous. This isn't a vaporcar, right? 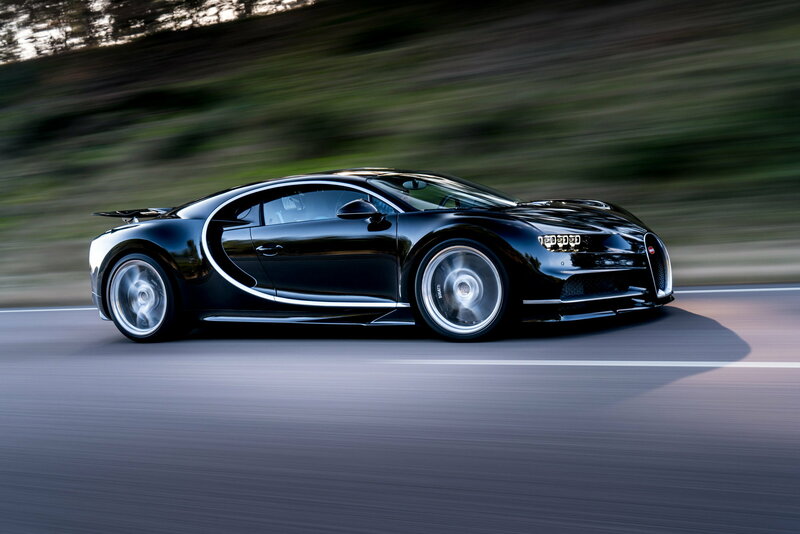 Otherwise yeah....insane new Bugatti....a proper Veyron successor indeed. Last edited by nist7; 02-29-2016 at 04:34 PM. ^ BoostedJack already bought almost all of them. Altegris has dibs on one. Dang...who are these people and how can I become one!? 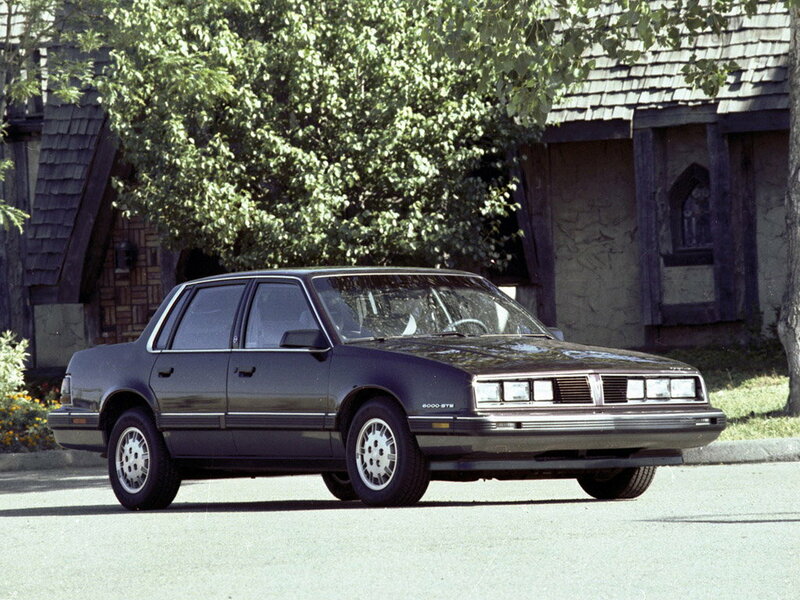 Don't hate me for saying this but the headlights remind me of the Acura headlights. Last edited by Black Tire; 02-29-2016 at 08:41 PM. 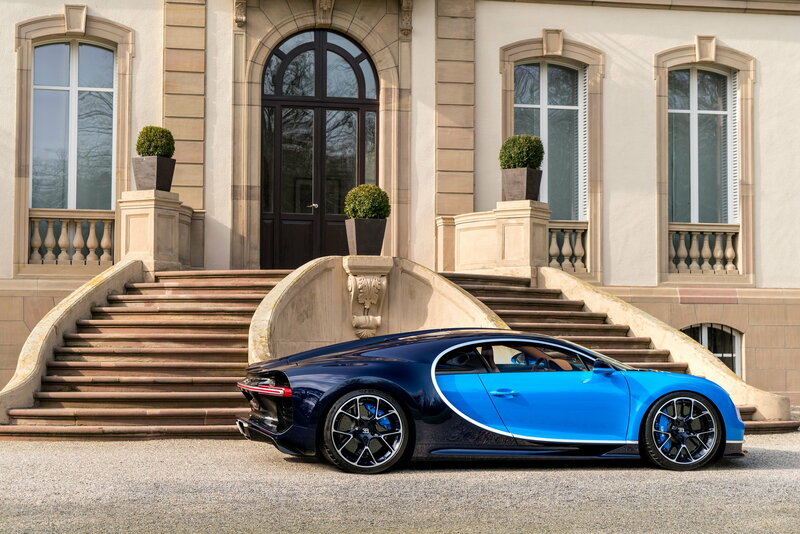 Behold Bugatti’s new Chiron. 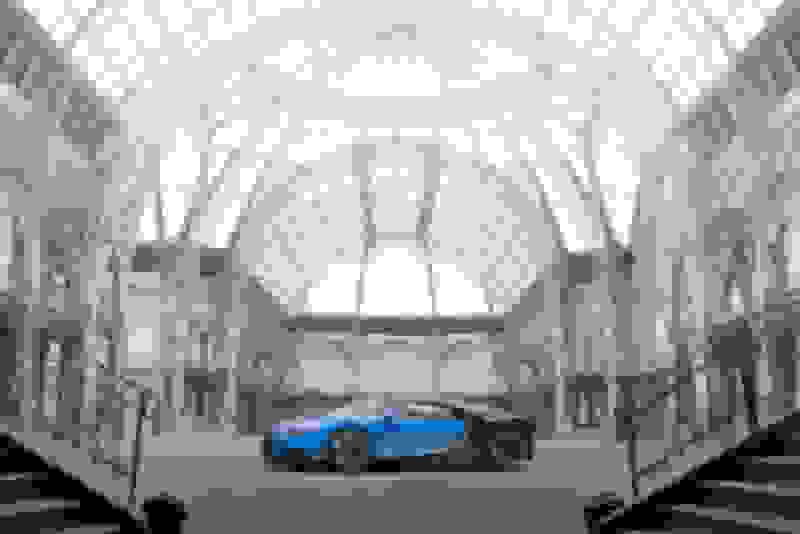 The much-hyped successor to the Veyron and potentially the fastest car ever to enter production has been revealed today ahead of its world debut tomorrow at the 2016 Geneva Motor Show. We’ll cut right to the chase. 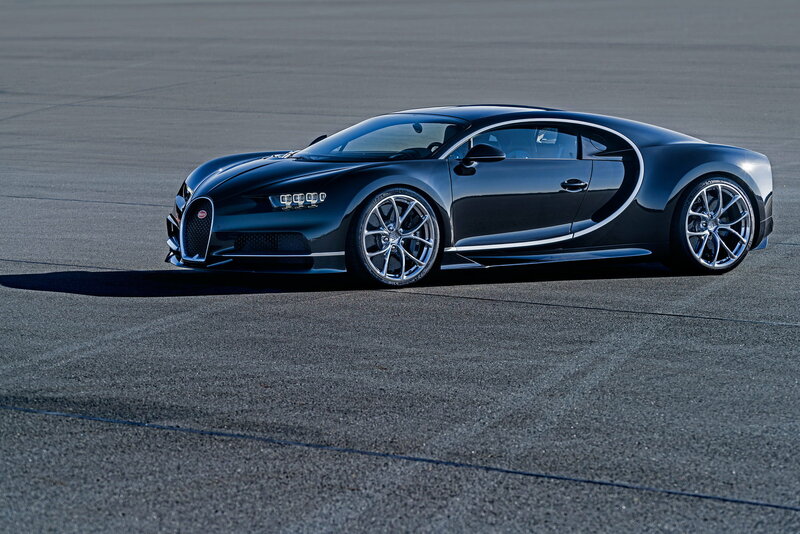 Bugatti hasn’t revealed how fast the Chiron will go, at least when unrestrained. Currently, all the company will say is that the Chiron has a top speed of 261 mph but this is a governed figure for the Chiron on public roads. Fans will be quick to note that this is slower than the current land speed record for a production car, a speed of 267.8 mph set by Bugatti’s Veyron Super Sport back in 2010. 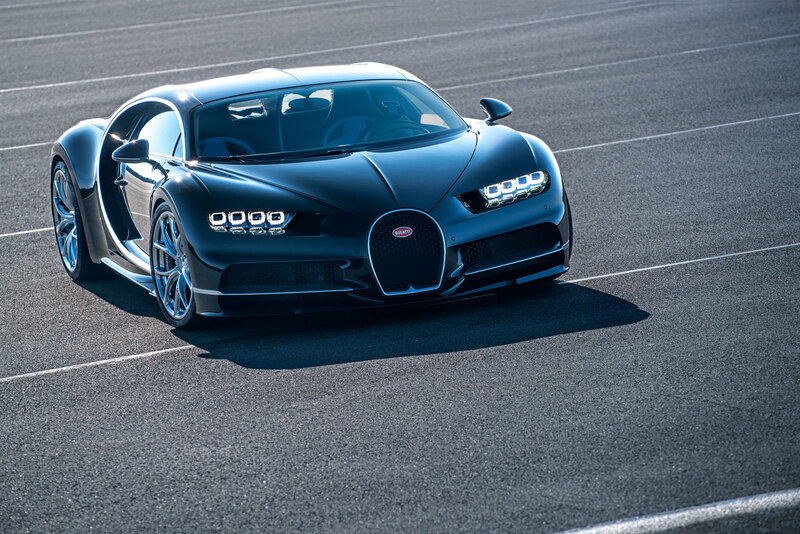 Yes, the Chiron can go faster but Bugatti remains quiet on just how much faster. A top speed of 288 mph is rumored. 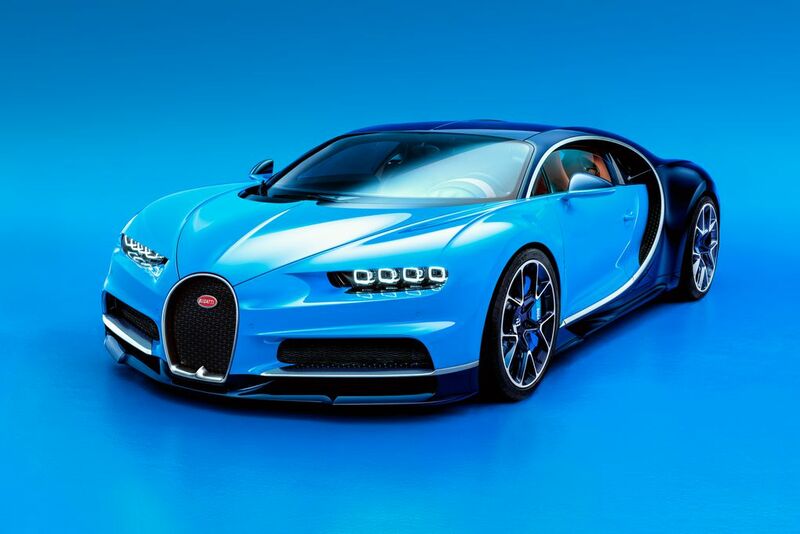 What Bugatti will tell us is that the Chiron will accelerate from 0-62 mph under 2.5 seconds, which means it’s quicker off the line than the Veyron Super Sport. Accelerating to 124 mph in the Chiron will take less than 6.5 seconds and hitting 186 mph will take less than 13.6 seconds, Bugatti claims. That’s quicker than times set by the Ferrari [NYSE:RACE] LaFerrari, McLaren P1 and Porsche 918 Spyder. Koenigsegg’s One:1 has been clocked hitting 186 mph in 11.922 seconds, though you could hardly call the One:1 a production car as just six examples plus one prototype were built. 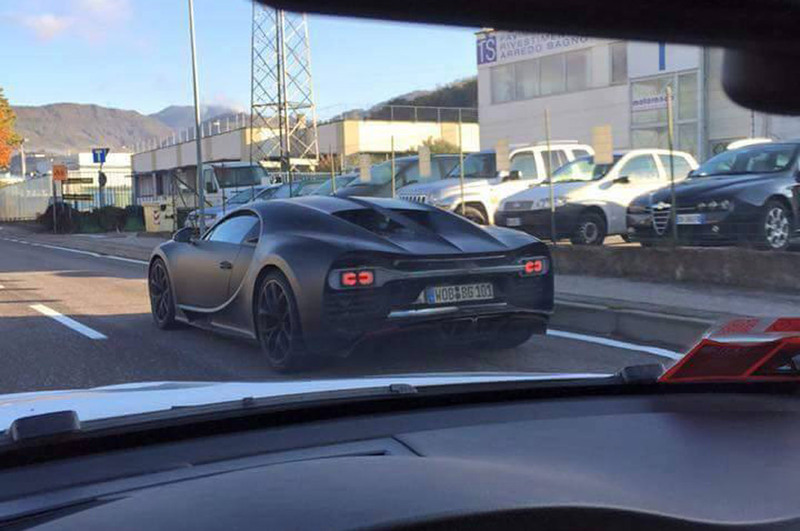 Interestingly, the Chiron hasn’t adopted hybrid technology just yet. We say yet because it’s thought Bugatti is saving the option for a more potent Chiron down the track, something hinted at by former Volkswagen Group CEO Martin Winterkorn. The engine is once again a quad-turbocharged 8.0-liter W-16 but now output has been dialed up to 1,500 horsepower (in metric horsepower so 1,480 hp for the United States) and 1,180 pound-feet of torque, the latter of which is available from as low as 2,000 rpm. This makes the Chiron the most powerful car in production, though this particular title is expected to pass soon to Koenigsegg’s Regera. 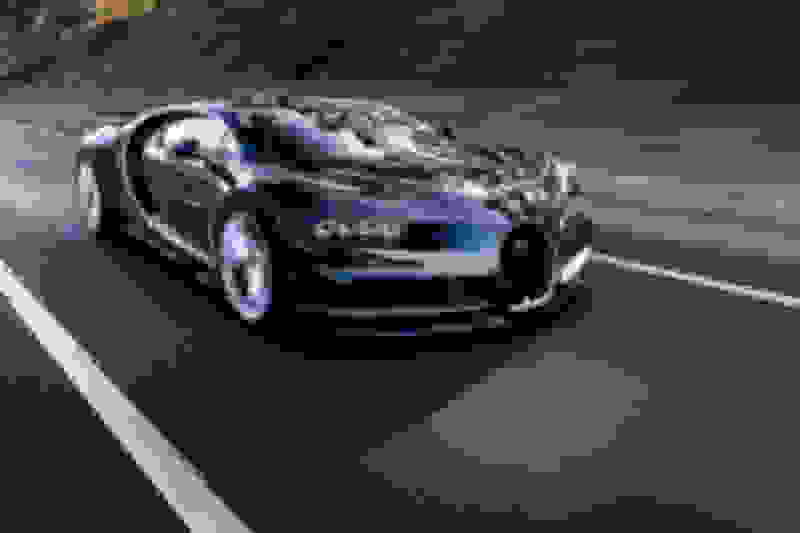 The extra power over the 1,184-hp Veyron Super Sport is generated via bigger turbochargers that form a sequential setup, referred to by Bugatti as “two-stage” turbocharging. Below 3,800 rpm, only two turbochargers are used. These are smaller and have very low spool-up times. Above the threshold, the two larger units come online. 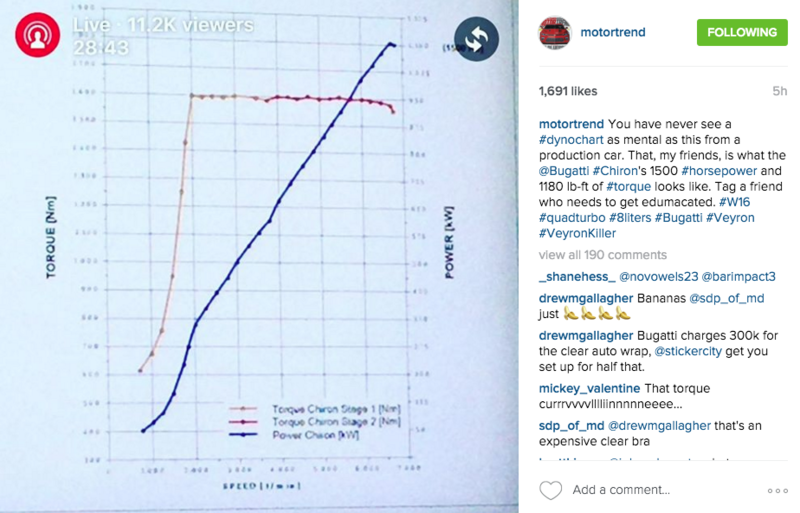 The result is said to be an “absolutely linear” power curve from 2,000 rpm. Additional power gains have come from a new titanium exhaust system that greatly reduces back pressure. To handle all of the grunt, the Chiron features an all-wheel-drive system with a front-axle differential with integrated inter-axle lock and a rear-axle differential with integrated inter-wheel lock. Before reaching these, all the drive torque must go through a seven-speed dual-clutch transmission. This transmission has the largest, highest-performance clutch used on a passenger car. All this sits within a new chassis that has a carbon fiber monocoque at its heart. The design is said to have rigidity comparable to an LMP1-spec endurance racer and features innovations such as the world’s first airbag capable of shooting through carbon fiber (used in the dashboard on the passenger side and in the seat housings), LED headlights and a driving modes selector. 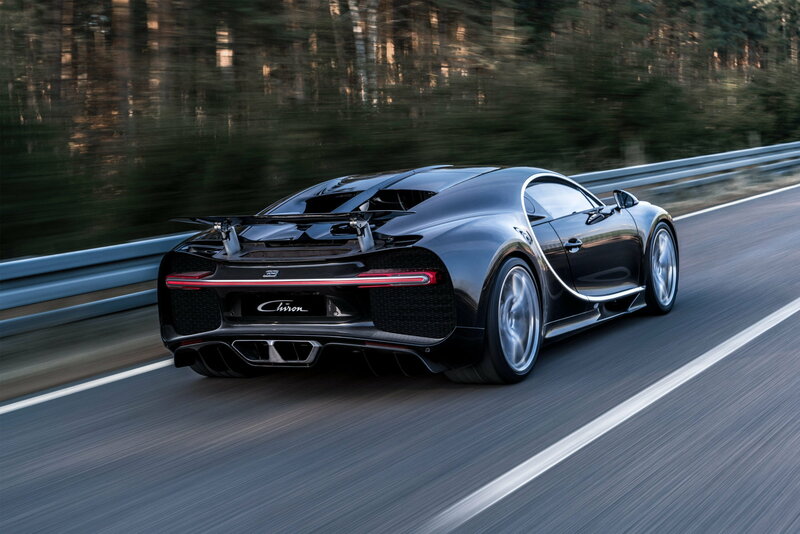 The outer skin of the Chiron is also made from carbon fiber. In the cabin, the focus is on the driver and here, like the exterior, there is an air of elegance and minimalism. For example, in order to keep the central console as slim as possible and to allow a spacious impression, the climate control and infotainment systems have been separated. In front of the driver is a combination of digital and analog displays. The speedometer runs up to 500 km/h (310 mph)—something you don’t see every day. Bugatti plans to build 500 Chirons, a total that likely includes all future variants of the car including a possible open-top version. Roughly one third of the production allocation is already accounted for, despite the car’s starting price of 2.4 million euros (approximately $2.61 million). The first examples are due to be delivered in the fall of this year. I love the blue one. Beautiful. This car falls solidly in the "meh" category. I respect it but don't want it. Also those headlights are going to look awesome in many rap videos. This car falls solidly in the "meh" category. I respect it but don't want it. Did I read somewhere that the top speed is based on how much the tires can handle not the engine output? Bugatii OBVIOUSLY ripped off the Acura ILX and TLX Jewel Eye headlights. I never claimed to not be poor. I'm sure it comes with very expensive custom tires that'll never see anywhere close to 261mph. But not the MDX or RDX right? Yeah pretty much. Most action may be seen on the road in front of hotel lobbies in London/Monaco/Bellagio/etc.